1.Maria Brown blew the whistle and sued Nutt & McAlister of SKG, alleging sexual harassment, hostile work environment, and mentions N&Ms failure to turn over records to Judge Acker. 2. Scruggs and Bartimus, Frickleton, Robertson & Groney have filed suit against State Farm, Nationwide, Allstate, USAA, and several engineering firms for overbilling the federal government for Hurricane Katrina damage. 3. Jones, Funderburg have sued Dickie Scruggs, Don Barrett, Scruggs law firm, Barrett law office, Nutt & McAlister, and Lovelace law firm over payment of disputed funds. Jones and Funderburg have asked to court to take control of SKG assets. 4. United States of America v. Dickie Scruggs, Zach Scruggs, Sidney Backstrom, Tim Balducci, and Steve Patterson for attempting to bribe Judge Henry Lackey. 5. Balducci blew the whistle against Scruggs & Co, and pleads guilty to bribing Judge Lackey. 6. Jim Hood, AG, sued State Farm for breach of the settlement agreement. 7. State Farm sued Jim Hood, AG for breach of the settlement agreement. 8. State Farm sued to disqualify Dickie Scruggs from Katrina cases. 9. E.A. Renfroe & Co sues whistleblowers Cori and Kerri Rigsby for violating the Alabama Trade Secrets Act and breaching confidentiality agreements. Except this post really sums up nothing about the real insurance issues or insurance law. Notice folks the implied threats against the Rigsby sisters, who by all accounts have had no involvement with the allegations against Scruggs. Most of what makes the so called insurance blogs these days is either old news, or half the story as Mr. Rossmiller himself pointed out in an rare moment of balanced commentary. Well folks, here on the Mississippi Insurance Forum you’ll get just insurance talk; straight talk in fact, the kind that even a Cowboy can understand without a bunch of frue-frilly legal double talk. That’s probably why this Cowboy-farmer enjoys reading Mr. Chip Merlin’s insurance law blog. While the talking heads sit in places like New York City and Portland Oregon ole Chip was over New Orleans way at the Fifth Circuit Court of Appeals listening to the actual arguments. He presents an analysis of the recent Broussard arguments that you won’t find anywhere else and he makes it understandable. I highly recommend it. In his reply to me there he summed up why you can’t trust a carpetbagger with this issue. Like in most cases it’s what these talking heads don’t tell you that matters most. Remember folks, State Farm threatened the engineers with termination because they found 2 instances of wind rather than flood in over 90 reports. Whadda you think the “boxing glove” hands people would do to a lawyer that doesn’t tote the company line? There is an informal brotherhood of those slabbed and/or destroyed. Among that brotherhood all know at least one person whose house was destroyed by wind but was only paid their flood coverage (if they had it). We are not professionally trained licensed engineers but in some cases the cause was most evident, such as in the picture of this house in Lakeshore which was also flooded but not subjected to wave action. This is a picture of the house across the street also smashed and flooded. The window in the house was removed by the owner as they salvaged some of their contents from the interior. In both cases the contents of these houses stayed with the house instead of being swept from it like so many others. This picture finishes the story, notice the house down the street left standing. All the homes on the street were built within a year or so of each other by the same builder. Also notice the hole in the roof of the house down the street that stood. How is it that the majority of the houses on this street stood while three houses in close proximity of one another were reduced to rubble? A tornado or mini tornado is the cause. 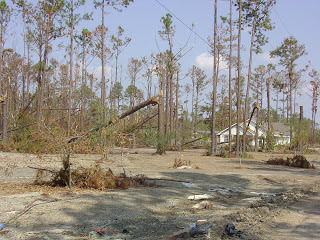 There was a line of snapped trees that lined up perfectly with the woods across the field from the destroyed houses on this street and through to the woods on the other side. I personally know of at least one such resident who was only paid on their flood policy instead of their private wind policy. That’s right ladies and gents, the bill was on you, the taxpayers. The right side of a hurricane is the wrong side to be on. You could take that sailor’s warning to the bank after Katrina – if there had been one after Katrina. The weather wizards say “ground zero” is where the eye of a hurricane makes landfall. Katrina’s eye passed just to the right of the Louisiana-Mississippi state line in Hancock County, Mississippi. We’re the orange spot on the map. Of course, it didn’t take the wisdom of a wizard for any of us to figure out we were “ground zero”. All we had to do was take a look around and see nothing – “zero” – on the “ground” escaped Katrina’s wrath. There’s still more nothing than something down here, rebuilding is stalled in the court, the economy is heading further south, and some are starting to wondering if we haven’t hit “Ground Zero for Hope”. 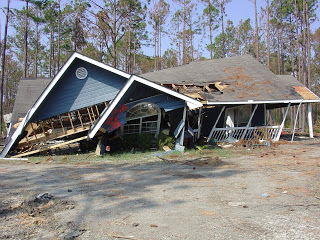 The right side of an insurance claim is the wrong side on after a hurricane. When you purchase a homeowner’s policy with hurricane coverage, you expect the insurance provider to know what a hurricane is and what it does. If they don’t, you’d sure expect them to look it up and not make it up. Nonetheless, make it up appears to be exactly what some did. All 82 Mississippi counties were included in the disaster declaration and 60% (49) were eligible for full federal disaster assistance. The insurance folks north of the Coast didn’t seem to have a problem understanding that water damage is covered if the wind blows a hole in your roof and water gets in your house. Most of us didn’t even have a roof after Katrina blew through here. You would think, then, it wouldn’t be hard for the ones they sent down here to figure that water damage was done before the surge followed Katrina inland. 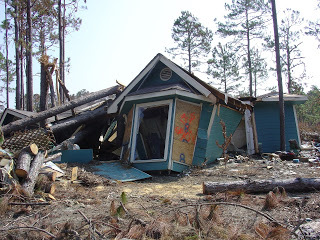 Actually, it appears they did figure it out – probably right about the time they started trying to figure out ways to get by without paying when all that Katrina left behind was a slab. The wrong side of a hurricane to be on is the one it takes a lawyer to make right. Here are a few key definitions and concepts which might help those new to the insurance forum more rapidly understand the nature of the insurance problems our society faces. I will add more as time allows and hopefully we might combine them with other concepts. One definition of insurance is a system to make large financial losses more affordable by pooling the risks of many individuals and business entities and transferring them to an insurance provider for a premium. More basically insurance is the process of the assumption of risk from one party to another for a fee. The key to understanding insurance is the concept of risk assumption. In insurance terms risk is the chance of loss of that which is insured. For the purposes of this web site the main type of insurance studied is property/casualty in general and catastrophe insurance (CAT) in particular. ISO defines a catastrophe as an event that causes $25 million or more in insured property losses and affects a significant number of property/casualty policyholders and insurers. What is the role of insurance providers? Insurance providers core function in society is that of helping to manage risk. Insurance plays a vital role in helping individuals and businesses prepare for and recover from the potentially devastating effects of a disaster such as a catastrophic hurricane or earthquake. Insurance providers help society pre-pay for their risk needs. Catastrophic insurance providers have a special role in helping entire communities pre-pay for their disaster needs. Because their losses are more volatile the property/casualty insurers invest largely in high-quality liquid securities, which can be sold quickly to pay claims resulting from a major hurricane, earthquake or man-made disaster such as a terrorist attack. Who are the leading providers? Data from the National Association of Insurance Commissioners (NAIC) identifies the 10 leading writers of non-governmental property/casualty insurance by direct premiums written during the 2006 calendar year. NAIC percentages were based on the U.S. total including territories before reinsurance transactions, excluding state funds. It should be noted the federal government is considered by many CEO’s of insurance and individuals as the insurer of last resort. The federal government is also the sole insurance provider for basic flood coverage in the United States. How’s the Weather – Model? Today we begin with the weather forecast but not just any weather forecast mind you. First off is this story from Reuters which proclaims our property and casualty insurance rates in the US will remain high due to the massive hurricane that is surely coming to destroy us all. As a result, the article concludes our P&C rates will continue to increase. So proclaims the popular press which by the way has never met a scientific story on global warming and Hurricanes they failed to butcher. “One big problem is that catastrophe models are not reliable predictors of when or where a monster hurricane is going to strike, according to Karen Clark, vice chair of AIR Worldwide, one of the leading modeling firms. So here, in the National P&C Underwriter, an insurance industry trade publication, we discover a deeper truth about these climate models and as borne out by the last two Hurricane seasons which have also come complete with prediction of coastal doom; namely that weather models are notoriously unreliable predictors of when or where a windstorm may strike. This basic fact does not stop insurers, especially those in reinsurance from paying big bucks for weather forecasting as most have their own in house forecasting units like this one. We submit that despite the limitations of weather modeling there has to be good reason the insurance industry keeps such a close eye on the weather. However, insurance seems to be one business that profits handily even when they completely miss on the extended forecast like these past two years. Author Posted on December 11, 2007 September 22, 2015 Categories Sop4 Comments on How’s the Weather – Model?